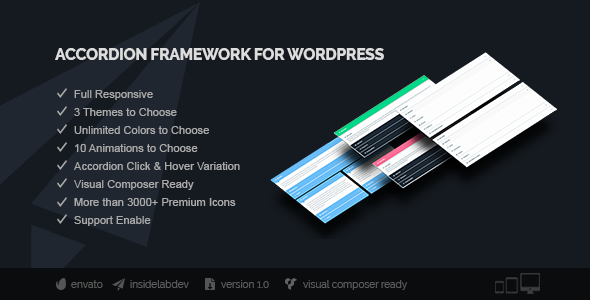 Accordion Framework for WordPress is a robust and beautiful framework to made your accordion area shine with Visual Composer for client job or your own project in a awesome way. With three themes available, unlimited colors, animations, light & dark versions and a lot of examples you can do anything you want, the simplicity is the key. Grid system is a awesome and robust tool that comes with visual composer for you divide your accordion by columns. Icomoon ultimate font & Nucleo outline and solid is a gift that you have inside this pack with over 3000+ icons your accordion will look awesome with this, add colors, animations whatever you want.